Well, do we have an interesting challenge for you this week, from the Paper Craft Crew Design Team! Are you like me; you fall in love with all of the gorgeous Designer Series Paper, you buy tons of it – then you don’t want to cut it up, because it’s “too pretty”!? Well, today’s the day to break into that stash, and show it off! Our challenge this week is to make your Designer Series Paper the star of your card – any way you want. 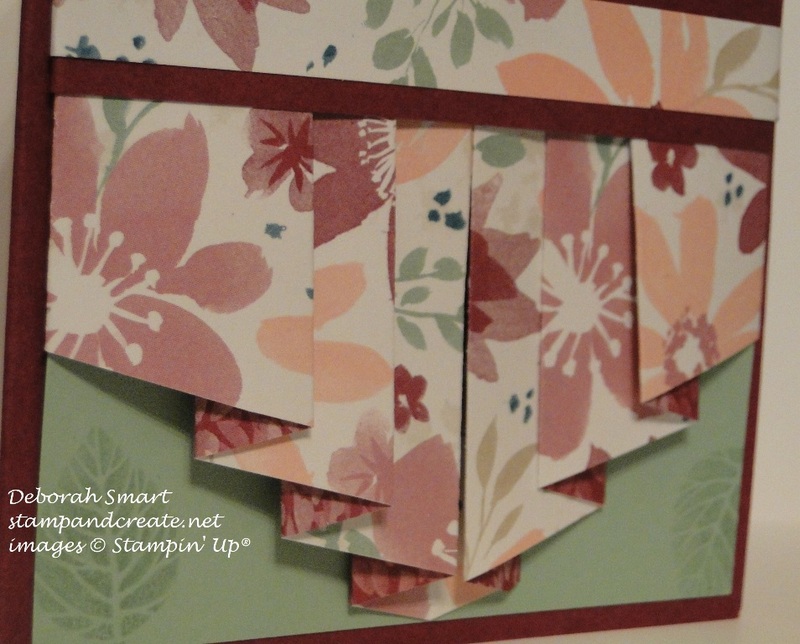 I was stumped for a minute – and then I thought of a special fold that I wanted to try – so here it is! I have done a couple of version of the Pleat Fold (or drapery fold); this is now my 3rd version! I like how it shows off the gorgeous patterns on the paper, and with this version, you can show off the cardstock underneath as well. I started with a 3″ x 11″ piece of the Blooms & Bliss DSP. I scored at the following intervals: 1 1/2″, 2″, 3″, 3 1/2″, 4 1/2″, 5″, 6″, 6 1/2″, 7 1/2″, 8″, 9″ and 9 1/2″ . I measure up 1 1/2″ on each of the short sides, and marked the 5 1/2″ spot at the bottom of the long side. Using my Stampin’ Trimmer, I cut on the diagonal from the middle point to the 1 1/2″ on each side. I then folded on each of the score lines; you can see that I folded inward on each side, starting at the middle; that’s just how I wanted my pleats to show; you can do yours all one direction, or the other. I added a touch of Tombow liquid glue on the inside of each pleat, and then ran a strip of Tear & Tape across the top of all of the pleats, in the back, to keep them in place. On a panel of Mint Macaron cardstock, I used the leaf stamp from the new, limited time Thoughtful Branches stamp set, and stamped the leaves randomly in Mint Macaron ink, stamping off once each time. I then took the backing off of the Tear & Tape, and attached my pleated DSP to the panel. Across the top of the pleats, I added a strip of Rich Razzleberry cardstock, to which I then added another strip of the same DSP as the pleats are made. The sentiment, from the Thoughtful Branches set, was stamped in Rich Razzleberry ink onto Whisper White cardstock; I then used my 2″ Circle Punch to punch it out, and used the retired 2 1/2″ Circle Punch for the Rich Razzleberry cardstock circle behind it. I glued the sentiment on, then added 2 leaves that I die cut from the same pattern of Blooms & Bliss DSP; I used the coordinating Beautiful Branches Thinlits Dies and the Big Shot. Aren’t those leaves gorgeous, with the veining detail? The thinlit is actually the 2 leaves on a branch, but I just used my snips to separate them. 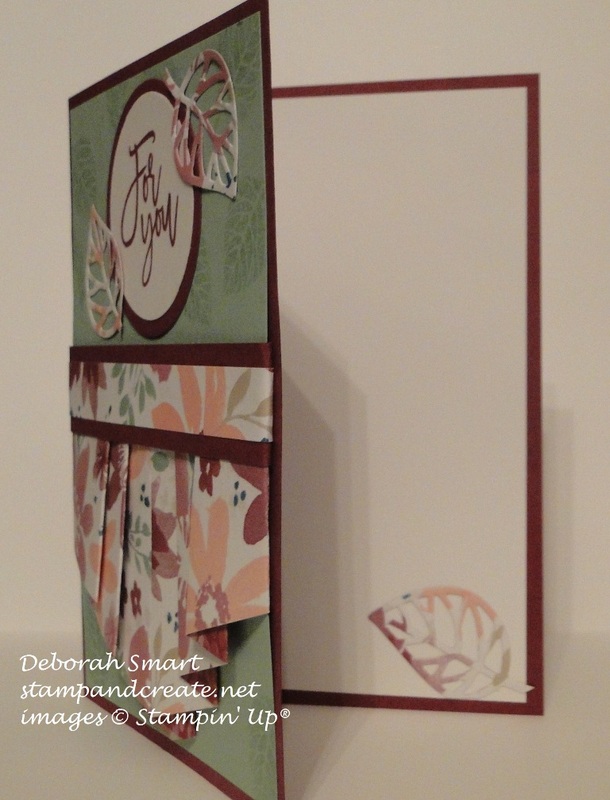 Once the card front was finished, I attached it to a card base of Rich Razzleberry cardstock. The Thoughtful Branches stamp set and coordinating Beautiful Branches Thinlits can be bought separately or as a Bundle – but only through August 31st!! Be sure to get yours soon, before they’re all gone – it’s such an amazing, versatile set. I’ve only just started using my Bundle, but I know I’ll be using it right through all the seasons, including Christmas (it has gorgeous trees!). Be sure to contact your demonstrator to get your sets, or contact me if you don’t already have a demonstrator, and I’d be happy to help you. Next Next post: It’s BOGO Time! That dsp is so pretty. Love the pleats. Going to try that one. Thx for the instructions! Thanks for your comment, Jackie! We really do have some beautiful DSP to show off, from Stampin’ Up!